Steven Mnuchin, President-elect Donald Trump's pick to be Treasury secretary, vowed on Thursday to close tax loopholes and expand economic growth through tax reform and job creation. Democrats such as Sens. Ron Wyden (D., Ore.) and Debbie Stabenow (D., Mich.) questioned Mnuchin about his offshore hedge funds and whether he used these funds to avoid taxes at a hearing of the Senate Finance Committee. Mnuchin, who is president and CEO of Dune Capital Management, assured lawmakers that he paid all of his taxes and said that as Treasury secretary he would work with the IRS to ensure that taxes are collected. "I, like all other hedge funds and many, many private equity funds, set up offshore entities that are primarily intended to accommodate non-profits and pensions that want to invest through these offshore entities," Mnuchin said. "As it relates to my own tax situation, these entities were either taxed as U.S. corporations or U.S. partnerships and in no way did I use them whatsoever as a way to avoid U.S. taxes," he said. "As Treasury secretary, if I'm confirmed I would look at these rules." "I would look to work with the IRS to close these tax issues that make no sense and make sure that we're collecting the proper amount of taxes," Mnuchin said. Stabenow asked whether Mnuchin supports closing tax loopholes that wealthy individuals use to avoid paying taxes. "I would support changing the tax laws to make sure they are simpler and more effective, yes," Mnuchin said. Wyden criticized Mnuchin's 2009 purchase of IndyMac, a failed California bank that oversaw thousands of foreclosures. Mnuchin defended his record, saying his group had nothing to do with issuing the risky loans that precipitated the financial crisis and instead modified loans to help many homeowners stay in their homes. 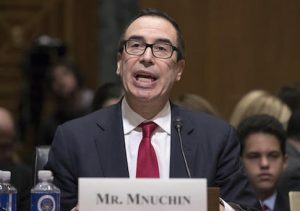 "Since I was first nominated to serve as Treasury secretary, I have been maligned as taking advantage of others' hardships in order to earn a buck," Mnuchin said. "Nothing could be further from the truth." Mnuchin said his experience in finance and banking convinced him that burdensome policies implemented in the wake of the financial crisis need to be changed. "I felt great empathy for the thousands of Americans who lost their home because of a system that failed them," he said. He said he shares Trump's goal of economic empowerment for every citizen, implementing trade policies that put Americans first, and restoring America's competitiveness for businesses. Limiting regulations and lowering taxes, he said, would increase economic growth. Mnuchin, who was Trump's national finance chairman during the presidential campaign, worked at Goldman Sachs for 17 years. His net worth is estimated at $40 million. Trump has touted Mnuchin's pro-growth agenda and ability to create jobs as reasons why he wants him to lead the Treasury Department. "Steve Mnuchin is a world-class financier, banker, and businessman, and has played a key role in developing our plan to build a dynamic, booming economy that will create millions of jobs," Trump has said. "His expertise and pro-growth ideas make him the ideal candidate to serve as secretary of the Treasury," Trump said. "He purchased IndyMac Bank for $1.6 billion and ran it very professionally, selling it for $3.4 billion plus a return of capital. That's the kind of people I want in my administration representing our country."